What did Ockley Green fourth-grader Justin* proudly show his parents on Back to School night? The new SuperSensory Literacy Space in the school’s learning center. SuperSensory Literacy Spaces are unique classroom libraries specifically designed for children in special education who need calming and/or stimulation to focus, and include highly readable, multicultural print and audio books, fidgets, nubby cushions, and kinetic sand. Justin has a learning challenge that makes reading difficult. 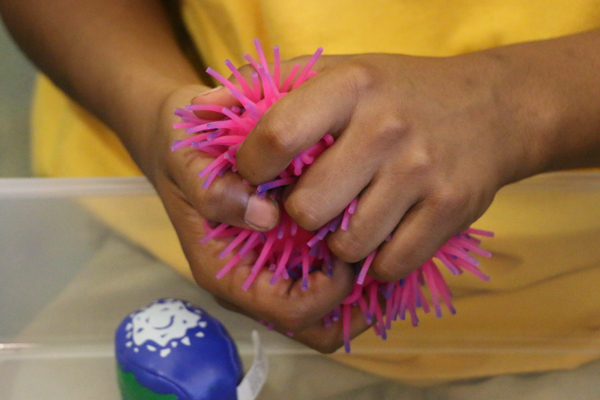 But when Justin visits the learning center now, he selects his favorite fidget from the Shadow Project-designed sensory space for increased focus while doing homework. “Justin’s parents believe in fidgets as sensory tools,” said Ockley Green Special Education Teacher Elise Bradley, M.S., who has taught in the Portland Public School District for nine years. “When Justin showed his parents the new sensory space, they were so happy to see that our school values fidgets as educational tools to which their son will have access. Elise said many of her 30 students in special education are asking to utilize the new sensory space for testing, and each one is beginning to understand what they need for improved concentration. One fourth-grader, for example, used a beanbag/pillow tower for propping up his tests so he could kneel while working for better focus. As Oregon’s special education population has grown in recent years (75,000 currently), and with students having increasingly diverse and complex learning needs, the role of community partners like The Shadow Project in schools has become more critical. The Shadow Project was selected for PPS’ collaborative Read Together initiative. Ockley Green, in north Portland, is one of five high-needs schools selected by PPS for services aimed at improving third grade reading benchmarks.